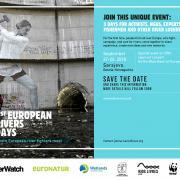 From September 27 to 29, we will hold a first European Rivers Summit, which will take place in Sarajevo. Goal of the meeting is to bring together river lovers and initiatives from all over Europe in order to exchange experience, develop ideas and network. The summit ends with a public Balkan Rivers open-air concert featuring artists from the Balkan region. Please share and save the date!